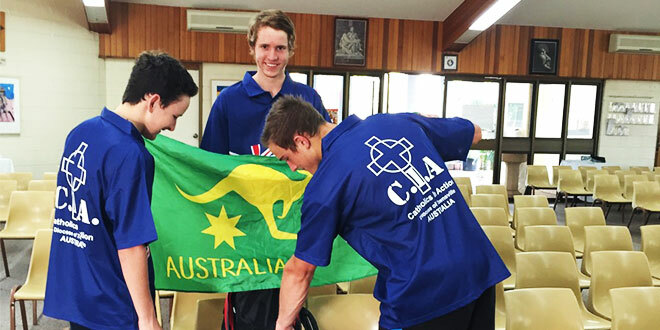 Preparations: Members of the Townsville diocese WYD contingent (from left) Hayden Hurst, Louis Hutchinson and Thomas Eastburn preparing for their journey. NEARLY three million young Catholics will descend on Krakow, Poland, this month for World Youth Day festivities, with 38 young people set to represent Townsville diocese. The contingent left Australia early on July 2 and is set to experience some historic Catholic sites as part of the pilgrimage to Krakow. The first nine days of the trip will be spent in Italy visiting Assisi, Florence and Rome where the group will attend a weekly general audience with Pope Francis and a private Mass in St Peter’s Basilica celebrated by former apostolic nuncio to Australia Archbishop Paul Gallagher. Louis Hutchinson, from the Mount Isa parish, said he couldn’t wait for the experience. “I am really looking forward to visiting Vatican City because it is such an iconic place where the Catholic faith is centred and also the Pope will be there, which is just a bonus,” he said. Host city Krakow is the home of WYD founder St John Paul II, with events organised including concerts, catechism sessions, reconciliation, Way of the Cross and a final Mass celebrated by Pope Francis. Louis said by attending WYD he hoped to strengthen his connection with God and also help the Catholic community grow. “I think it’s important to go not only to connect with God and grow stronger relationships with my faith, but also to gain life experience and to make friends,” he said.